We are not in the Age of Aquarius that had brought—to some of us—radical hope about societal change and a turn toward ecology, steady state growth, and different GDP metrics, including happiness. The age was about love, unity, integrity, sympathy, harmony, understanding and trust. The Age of Aquarius was about doing things differently, building the ‘share economy’, where cooperation and frugality were goals that would reduce our heavy human footprint on the planet. Community gardens, composting toilets, making clothes, raising chickens and making preserves, riding bikes and walking, job sharing and creating worker owned cooperatives that shared profit equitably was the stuff of change. Today we are in the Age of Green. Green cities, green businesses, urban greening, green buildings, green energy, green cars, making green money from green. The Age of Green is deeply different than the Age of Aquarius as there is an assumption that a transition toward a sustainable “green” society is possible with continued economic growth by using better technologies, enlisting nature’s services, and employing market incentives—that is, without changes in consumption patterns. Stormwater runoff a problem? Simply build infiltration trenches. Air pollution a problem? Plant more trees, add a green roof. Carbon emissions a problem? Just buy green products. Create a market for the emissions and use the profits to invest in forests and wind energy. With the proper quantification of nature’s intrinsic processes and recognition of them, we can unproblematically mitigate human impacts on those very processes. No longer do we need to address the difficult questions about the concentration of wealth and concomitant resource use, or fundamental institutional changes to create more level playing fields among nations and their peoples. This magical thinking is an interesting turn of events. As Norgaard points out (2010), it blinds us to the complexity of ecosystems, the ecological knowledge available to work with that complexity, and the economic difficulties of implementing ecosystem services strategies, even if they could be sufficiently deployed to mitigate the ravages of environmental exploitation and rampant CO2 emissions, for greater economic growth. There is a facile way that the implementation of ecosystem services is being advocated despite the lack of scientific certainty about the ability to manage ecosystems to achieve desired outcomes (Healey et al 2008). This is seen on the international level with initiatives such as the UN program for using market incentives to reduce deforestation to mitigate against climate change and retain CO2 forest sinks. The Reducing Emissions from Deforestation and Forest Degradation (REDD) is an effort to create a financial value for the carbon stored in forests, offering incentives for developing countries to reduce emissions from forested lands and invest in low-carbon paths to sustainable development. “REDD+” goes beyond deforestation and forest degradation, and includes the role of conservation, sustainable management of forests and enhancement of forest carbon stocks. But knowledge about ecosystems themselves is contextual; the quality of the background data on climate, soil conditions, and human impacts requires a great deal of on-the-ground research and debate about what to maximize and why. So the REDD path is more about preserving forests such that the institutional, economic and consumption changes to significantly reduce human impact on ecosystems, especially by the rich, can be put off or avoided. Instead of changing free trade agreements that further enable deforestation-derived products to be consumed by the west, we use market mechanisms to incentivize developing countries to preserve their forests, assuming all things are equal. But they are not. Indigenous forest populations or peasants are truly not the same in terms of values and economic context as those who purchase the wood products in big box retail stores. Turning to cities, these questions become even more complex due to the specificities of each city and its morphology, its climate zone, human preferences, institutional rules and regulations, and costs of changing obdurate hard infrastructure. The California cap and trade program’s urban forestry protocol provides funding for urban tree planting, assuming that the benefits can be homogenized by a simplistic formula: biomass calculated using equations derived from native or natural forest trees is adjusted by a factor of 0.80 when applied to open-grown, urban trees (based on 28 selected species) because of differences in biomass allocation between the tree populations (ARB 2010). These values are derived from the USFS i-Tree program that also estimates the additional GHG emissions of on-going maintenance. Already here there are a number of significant uncertainties that make such calculations problematic. Trees that grow in cities do so under very different conditions than in natural conditions. Soils are compacted, trees suffer from the impacts of air pollution, the watering regime is different, as is soil fertility. They are pruned and trimmed. The program does takes into consideration tree mortality but not the other more tree-specific and complex urban impacts on trees. The protocol also raises a provocative concept: does the planting of trees in the urban fabric constitute making an urban forest? Forests are historic ecological assemblages that are specific to bioregions and differ widely in density and composition that are indigenous to place, the soils, rainfall and other biodiversity. Urban forests are assemblages of disparate trees people like. Trees are jumbled together that come from different bioregions, from an ecological perspective, how does one describe this assemblage? Which parts of forest ecosystem science do you import from native or natural forests to describe these “novel ecosystems”? Does this approach even apply to an anthropogenic environment? More problematically is that there seems to be the need to justify planting trees from an economic value perspective. Does this imply that if a street tree does not provide monetary value, it should not be planted? Then what about our parks? What about the sewage treatment plant? Livable and beautiful cities are not necessarily constituted by infrastructure that has to justify its economic value. Sewage treatment plants provide public health protection, they are a common good, they are not justified by an economic calculus. We do not build parks based on an economic benefit formula. They are recognized as providing a public good. And thus, well maintained street trees, also provide benefits: beauty (for some), shade (for others), harmony and dignity overall. Creating an economic value for them is an artifact of the Age of Green. As I have written about before, successful tree planting requires commitment and funding by cities (Pincetl et al 2010); using cap and trade is grasping at straws, trying to get a program going in an era of austerity due to a tax structure that rewards the 1%. If people want trees in cities, they should pay for them through taxes and ensure they are professionally maintained as a common good, whether or not they sequester carbon, stormwater, diminish particulates or provide shade. Each one of those attributes may be incrementally provided by trees (or not), but the “services” will depend on their location, distance from a road, whether there is infiltration available for the stormwater, the size of the tree, and many, many other very situational factors that vary widely across cities, and trees. The fundamental issue is that budgets for cities in the U.S. have declined. It is not that trees provide economically quantifiable benefits that are not recognized. The question then is why green now? Why does the color green captivate us so? What is the substance of the shorthand implied? Perhaps like “sustainability” it is the term of the period and we can no longer even think of any other that conveys sensitivity to the environment. Once launched it is free for the using and manipulation, the twisting of the meaning. 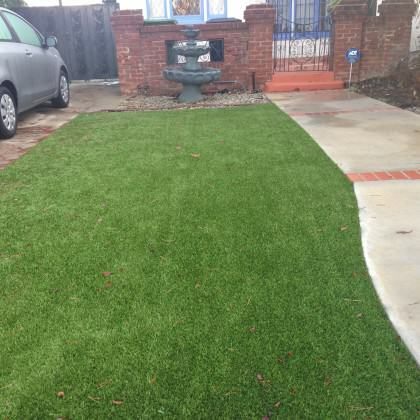 In my neighborhood, green now means astroturf instead of lawn, requiring the balding of the earth beneath it and nearly sealing it, impairing the absorption of water. 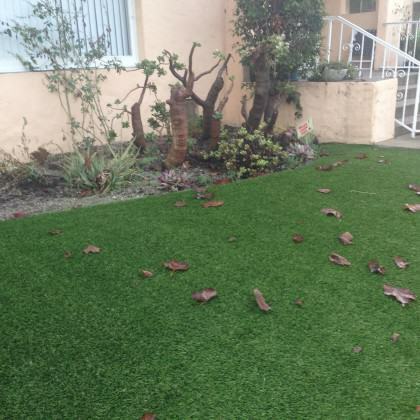 The plastic lawn is then rolled out over it. No life can survive this treatment, no worms or insects, and certainly no food for birds. I was assured it was permeable though, in case we get rain in Los Angeles. 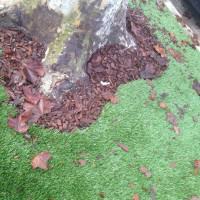 To me astroturf is the ultimate green value. Petrochemical companies continue to make profit, nothing really changes in terms of the aesthetic of the landscape. Green as the predominant idea of nature prevails. Obviously the push for green is problematic for a host of reasons. Without rigorous urban ecology (and urban hydrology) that treats cities as distinct and as varied as ecosystems and watersheds, it will be difficult to evaluate what techniques are likely to make a difference in making cities more porous to natural rhythms—if that is the goal. Some mitigation of urban impacts is possible, but it needs to be calibrated to the place. Ecology and hydrology have about 100 years of field experience and data collection. Cities need the same kind of attention if the green route for services is desired, and a financial justification seems requisite. So far the benefits have been small and are likely to remain so, until other values begin to change so that the playing field is more level. Alternatively we can embrace beauty and livability, think about the place in which the city is located, what seems appropriate given its climate and surrounding ecosystems, and develop strategies to make cities respond to those. Cities might end up looking very different from one another, and from place to place. However, such change will most likely not occur unless there are far wider and deeper societal changes about living on the planet. While the Age of Green can be seen to indicate some social sentiment that we need to change, it is still a path of business as usual. Instead it may be time to take Naomi Klein seriously; we cannot continue on the same path of economic growth and consumption—that includes quantifying and then monetizing nature’s services—and expect to truly change our relationships to the environment. More green businesses, creating more green products, off-setting emissions does nothing to reduce consumption of goods—green or not. There are natural limits to our spaceship Earth. Perhaps addressing how and why we have unleashed consumption as our pathway for redemption should get more scrutiny. This is beginning to happen through analyses such as Thomas Piketty’s Capital in the Twenty-first Century, Noami Klein’s This Changes Everything, Richard Norgaard’s cautionary analysis of the quantification of ecosystem services and others. The Age of Aquarius challenged the relationship between economic growth and happiness in the 70s. It was met with the Reagan/Thatcher revolution that attacked the regulatory supervision of capitalism, and a liberalization of economic activity. We have reaped the consequences this deregulation and growth of free trade in the rampant growth of greenhouse gas emissions, the reduction of city and governmental budgets and their regulatory authority. Free trade shifted production to places like China and India, exporting the environmental burden of production with it. One response has been REDD, and other UN programs to incentivize clean energy production in those places. Reducing consumption in the west is not on the table. More careful unpacking of the rise of the Age of Green is certainly called for. This will help us to contextualize it and hopefully begin to make changes because they need to be made rather than trying to fuse money making with the alternatives that need to be implemented. The Age of Aquarius proposed changes in how we as humans interact with one another, and what makes a good life. Sharing, working together, making things, more equity in income and access to the essentials for happiness may be a more sure way to bring nature back in. Air Resources Board 2010. http://www.arb.ca.gov/regact/2010/capandtrade10/copurbanforestfin.pdf accessed Nov. 30 2014. Hanemann, W.M., Dyckman, C., 2009. The San Francisco Bay–Delta: a failure of decision-making capacity. Environmental Science and Policy 12 (6), 710–725. Healey, M., Dettinger, M., Norgaard, R.B. (Eds. ), 2008. The State of Bay–Delta Science, 2008. CALFED science program, Sacramento, California. Klein, Naomi. 2014. This Changes Everything. New York: Simon & Schuster. Norgaard. R. B. 2010. Ecosystem services: From eye-opening metaphor to complexity blinder. Ecological Economics 69:1219-1227. Diane E Pataki, Margaret M Carreiro, Jennifer Cherrier, Nancy E Grulke, Viniece Jennings, Stephanie Pincetl, Richard V Pouyat, Thomas H Whitlow, and Wayne C Zipperer 2011. Coupling biogeochemical cycles in urban environments: ecosystem services, green solutions, and misconceptions. Frontiers in Ecology and the Environment 9: 27–36. Pikkety, T. 2014. Capital in the Twenty-first Century. Cambridge: Harvard University Press. Certainly a refreshing look at California’s tree planting initiatives. Thank you for this writing, Stephanie. It’s especially promising to see the mindset change happening at the local government level and I enjoy seeing your own urban metabolism approach, which should indeed help those folks rationalize the process. Are there some more examples you can point to of this mindset exemplified in city planning practice?